I read this article and found it very interesting, thought it might be something for you. The article is called Research on Philanthropists and Effective Giving and is located at https://www.medalofphilanthropy.org/research-philanthropists-effective-giving/. The Carnegie Medal of Philanthropy commissioned Portland Communications to conduct research about perceptions of philanthropy and effective giving among target audiences. The first phase of the research was an audit of the digital and social media landscape. This established a baseline of how philanthropy and effective giving are viewed. The second phase focused on understanding the perceptions of professionals working in the philanthropy sector in the United States. This group provided a broader perspective on the sector and the importance of effective giving in day-to-day experiences. The research approach involved running 100 computer-assisted telephone interviews. The final phase of the research focused on interviewing the wealthiest 0.1 percent, including Carnegie medalists, notable philanthropists, and other high-net worth individuals. The in-depth interviews allowed Carnegie to explore perceptions of philanthropy and gain perspective on effective giving. The overall findings illustrated the most common motivations driving philanthropists and how they choose to interact with the philanthropy sector. Most importantly it allowed Carnegie to understand how to help future philanthropists find their motivations for giving in an incredibly diverse philanthropic landscape. Philanthropists tend to be idiosyncratic, independent thinkers who take pride in developing their own ways of contributing. Our strategy should work to recognize and celebrate those qualities. The philanthropists we interviewed talked us through their approaches to giving and how they evolved over time. The vast majority of them had adapted and developed their approaches in an effort to make them more effective — and ultimately more satisfying. Understanding this journey helps us to better understand the mind-set of philanthropists and identify when and how we can engage with them in the future. In both cases, but especially the latter, we heard of individuals evaluating the process and being driven to get more directly involved in order to improve outcomes. Greater consideration is given to the recipients of giving or donors begin to coordinate the work themselves. The causes still tend to be of personal interest but donors do more research to identify the areas of greatest need. Donors expect regular updates and/or seek qualitative/quantitative markers of success, e.g. wider stakeholder feedback. 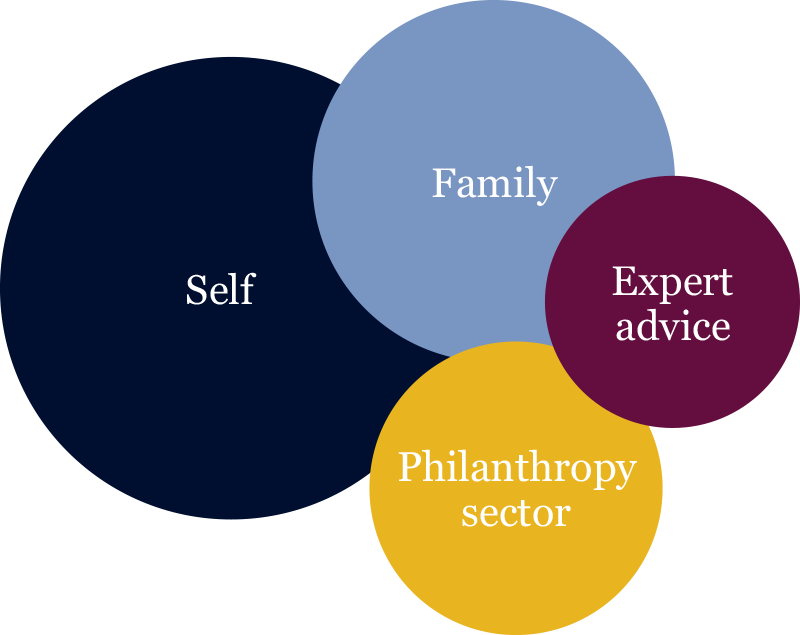 As part of our research, we wanted to identify the external influences that impacted the philanthropists and their giving — influences that we could potentially tap into. Always on the alert for spontaneous leads, we continued to probe and prompt at each stage of the journey. We discovered that only limited conversations are currently taking place, with very few sources referenced. This reinforces the idea that philanthropists are independent by nature. They follow their instincts. They make their own way. Where do you typically receive information about the philanthropy sector? How influential are the inspirational individuals at inspiring the work of philanthropy? Please rate this on a scale of 1 to 10 where 1 is not at all influential and 10 is extremely influential. the following considerations in determining the worthiness of a given cause? What do you see as the worthiest causes for philanthropy? Please rate each of the following causes on a scale of 1 to 10 where 1 is not at all and 10 is extremely worthy. Mean score shown. Overall, how focused is the work of the philanthropy sector in bringing about positive impact? to ensure a focus on positive impact? Select any/all that apply. How interested would you be in personally hearing about effective giving strategies in philanthropy?